Duesouth Escapes embodies the spirit of adventure many dream of, but few have the courage to pursue. 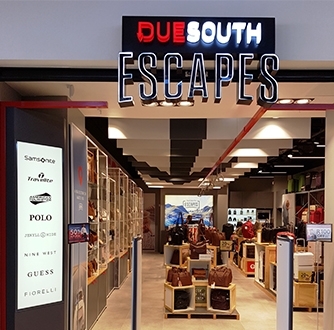 Duesouth Escapes caters for modern, hi-tech travellers who demand a retail experience suited to their adventurous journey. Some of the brands we stock include SKRoss, Thule, The North Face, PACSAFE, Osprey, Jekyll and Hide, Nine West, Fiorelli and more.